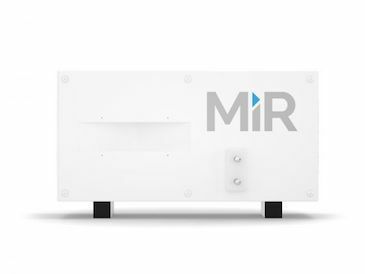 The MiRCharge, a fully automatic charging station, easily allows MiR robots to reload their batteries as needed. It’s a small, non-intrusive station that uses standard power, which can be easily integrated into nearly any environment. How Can the MiRCharge Improve Your Facility? Keep your MiR robots running around the clock with a fully automatic charging station. The MiRCharge is flexible so it can offer a variety of deployment options to meet your needs, and it also collaborates with MiRFleet. As robots maneuver around your facility, they can automatically return to the charging station when the battery falls below a specified limit. If you prefer, it can also be programmed to charge between deliveries. The variety of options available allow the robot to run nearly continuously, and it can charge a MiR robot in approximately 2 hours. If the robots are deployed using MiRFleet, the system will evaluate battery levels & job loads, then optimize & recharge so the fleet can run around the clock. MiRCharge is also discreet and easy to install. Unobtrusive in design, it uses standard power outlets which give you the flexibility to power and deploy your mobile robots. Wall mounting to be flush with the floor. 4.5 cm from the floor to bottom edge. Ambient temp. range from +5˚C to 50˚C and humidity from 10-95% non-condensing. Exhaust fan on both sides of unit for overheating protection.